PRESENTED BY DUSK DANCES INC. 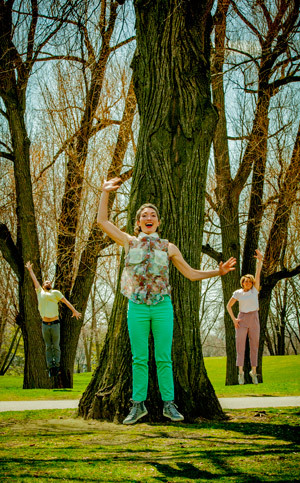 The 24th annual Dusk Dances Festival returns to Withrow Park this summer with another week of exciting and entertaining dance works from Canada’s finest dance makers! Waving is Funny explores the many different reasons why and how we wave. The absurdity of waving and how quickly it can shift from a recognized gesture to something else; the jazz hands of Bob Fosse or the instruments in a marching band, resonate in the work and demonstrate the complexity of this simple gesture. The result is a distinctly human work - thoughtful, cultural, and relatable, tied together with this very funny gesture that we all know so well. A collision of three distinctly unique dance artists, arriving at a strikingly original and compelling dance work. A metaphor for the world we live in, this new work explores the ways in which different people come together, to find commonalities and a space for collaboration, while maintaining the particular attributes that make each of us special. A Dusk Dances commission and a world premiere. A brand new contemporary tap dance work, set to live music. This work delves into the origins of the form - a time when dancers and musicians jammed in cabarets and night clubs, and improvised nightly to create original performances. Five dancers interact with a jazz vocalist and a bass player to create a magically wondrous work that connects to the rhythm and energy of the city we live in. 2:30 pm - DANCE performances begin! Withrow Park is located south of the Danforth, between Logan and Carlaw in Toronto, ON. Closest TTC subway station: Chester.